Add beef, sliced onion (or 5 to 6 shallots sliced), ginger, garlic, spice powders, vinegar and salt into a pressure cooker. Mix well and pressure cook till done. Time varies according to the kind of meat you are using. Add one cup of water if it takes a long time to cook the beef. Evaporate the excess water left in the beef after cooking. Heat 1 tbsp oil in a non-stick pan and fry the coconut pieces till light brown. Drain and keep aside. Now add 2 tbsp more of oil and fry the onions, green chillies and curry leaves till the onions turn light brown. Add the cooked beef and the fried coconut pieces and fry till the meat turns to a dark brown color. 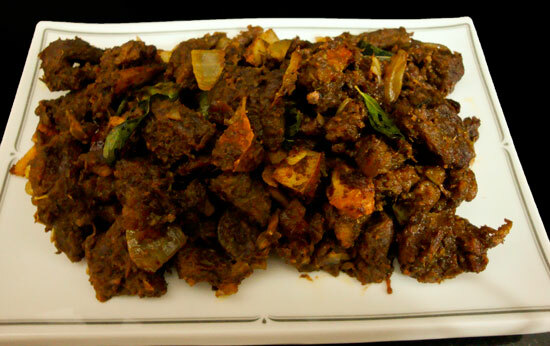 Delicious ‘Kerala Beef Fry’ is now ready to be served. 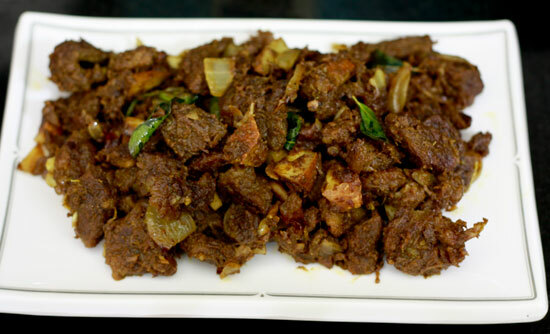 ‘Kerala Beef Fry’ is a very good side dish for rice, appam, chappathi, porotta and bread. Enjoy! I love beef fry, but alas i am the only one who loves it so i never make them avtually i have never made them myself. When we had this we had for few days and my hobby was to go to the kitchen and pick the coconut pieces. This looks so so good. Very inviting beef fry, my hubby’s favourite.. 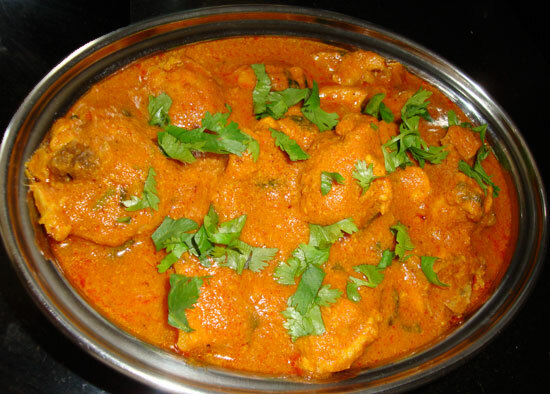 Very tempting pic :), reminds me of my days back at home, can I use the same recipe for mutton? Chechi looks thakarpantou..will try this in mutton..
You can surely try ‘Kerala Beef Fry’ recipe using mutton. I am sure your family will love it..